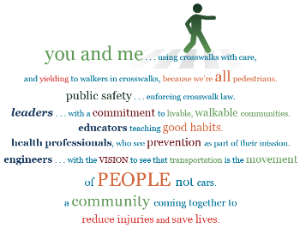 The CIty of Gainesville, FL was recognized this month with a bronze designation from Walk Friendly Communities. Enforcement practices, complete streets implementation and land development ordinances all contributed to the recognition. For details about the application process visit Walk Friendly Communities. For a description of Gainesville’s bicycle and pedestrian program visit the city website. More details on the Mayors’ Sole Challenge! Join Winter Park Mayor Ken Bradley, Eatonville Mayor Bruce Mount and Maitland Mayor Howard Schieferdecker on Saturday, October 6, for the most fun walk EVER! Bring friends, family, kids and colleagues for a friendly community competition. There are free t-shirts for the first 400 entrants, and other giveaways throughout the event. A morning stroll through Winter Park, free food, health screenings and music from the Macedonia Missionary Baptist Choir…what’s not to love? Please register to participate. The team with the most walkers wins a prize – and bragging rights! Orlando County Schools Walk N’ Roll Program is starting up for the new school year. Walk N’ Roll is a monthly program that encourages kids and parents to use transportation other than cars to get to school by walking or riding their bikes or scooters. The campaign kicked off at Audubon Elementary in Baldwin Park on Wednesday, September 12; over 100 iYield4Peds flyers and bumper stickers were given out. Walk N’ Roll will continue each 2nd Wednesday throughout the year, at Audubon and other elementary schools. Check here for more details . OOSSSS S School has already begun, but it is never too late to take a good look at current signage and crosswalk effectiveness and to plan for improvement. 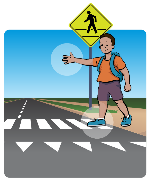 The National Center for Safe Routes to School has good information about school walking and biking routes. According to the Center for Disease Control (CDC), more than 2,600 Americans die every day from some form of cardiovascular disease. Regular moderate-intensity exercise, together with a healthy diet, may reduce your risk of developing type 2 diabetes by 40 to 60 percent.